I love Asian chicken and rice dishes, from congee, to Hainanese chicken rice, to bái qie ji. 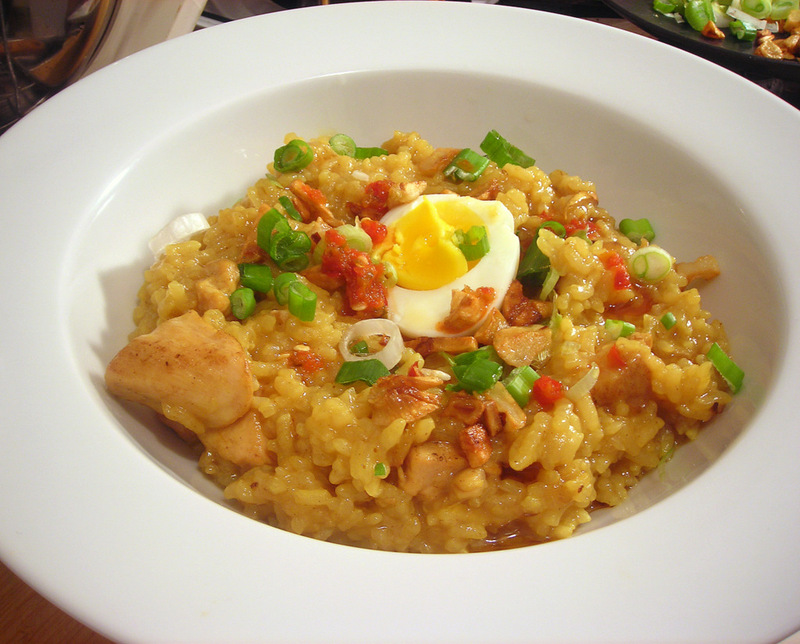 You can imagine my delight when I came across this recipe for arroz caldo (otherwise known as Filipino chicken rice porridge). As it happens, I had frozen a couple of quarts of Chinese chicken stock several months ago which I could finally put to good use. I like my porridge on the thick side, with a consistency approaching that of risotto. As Jun notes in his blog post, if you prefer a thinner porridge, simply add more chicken stock. Sauté the garlic in oil in a medium saucepan over medium heat and cook until golden brown, about 2 minutes. Transfer the garlic to a paper towel-lined plate to drain and set aside. Add the ginger and onion, and cook until the onion is translucent, about 3 minutes. Add the chicken and brown for about 5 minutes. Add the rice, chicken stock, and fish sauce, cover the pan, and simmer over medium to low heat. Stir frequently and simmer until the chicken and rice are cooked through, about 25 to 30 minutes. Ladle the arroz caldo into bowls and serve with bowls of hard-boiled egg, scallions, fried garlic, calamansi, sriracha and fish sauce on the side. (1) — Substitute vegetable oil instead. Rendered chicken fat or schmaltz will result in a richer, more intense-tasting porridge. (2) — Essentially chicken stock infused with ginger, garlic and star anise. Water is fine as a substitute. 03 Jan	This entry was published on January 3, 2012 at 2:44 am. It’s filed under food, general and tagged chicken, comfort food, dinner, Filipino food, food photography, recipe, rice. Bookmark the permalink. Follow any comments here with the RSS feed for this post. Your presentation looks good. 🙂 It looks more of a risotto than the traditional arroz caldo, which is your goal, so good job. How much chicken stock should I add if I don’t want it with risotto consistency? Usually, when I make congee, I make way too much and end up freezing the remainder. I don’t like leftovers as a general rule so you might say I had a vested interest in reducing as much of the liquid as possible. I probably cooked it for a little longer than the listed 25 to 30 minutes. That said, if you like your porridge on the soupier side, you might consider adding 6-7 cups (note that Jun recommends 5 cups) or reducing the cooking time.